DL Hughley’s The Endangered List, reviewed. In a Comedy Central special, DL Hughley lobbies the EPA to have African-American males declared an endangered species. Photograph by David Hathcox/Comedy Central. 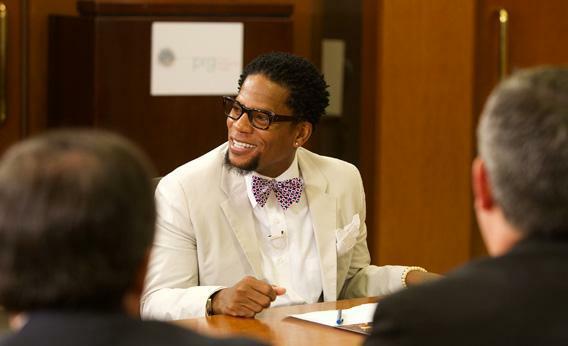 Cable-news viewers may already know that the actor and comedian D. L. Hughley has developed into a political commentator. Four years ago, he headed a short-lived CNN show. These days, he’s an occasional talking dreadhead on MSNBC. The producers of Countdown with Lawrence O’Donnell, which is the thing that you are watching when Rachel Maddow signs off and you can’t find the remote, may even have memorized his phone number. (They definitely know by heart the digits of Martha Plimpton, apparently our foremost expert on abortion policy.) Fine by me. He fights the good fight concisely and never takes himself too seriously. Now, with DL Hughley: The Endangered List (Comedy Central, Saturday at 11:00 pm), the star is presenting think-tank material for the Daily Show set and taking himself serio-comically. The Endangered List is a mockumentary so intriguing that it entertains even with its misfires—a one-hour special about the systematic problems of the black underclass. Sharp barbs and rote yuks mingle with repackaged muckraking and sober headshaking as Hughley lobbies the EPA to have the African-American male declared an endangered species. It’s a coast-to-coast, tongue-in-cheek, uplift-the-race quest. Plus there’s stand-up. While the show’s format owes something to the Michael Moore school of docu-provocation and also borrows a few tricks from Sacha Baron Cohen, its tone suggests that Comedy Central’s fake news division has drafted Hughley as a special correspondent. The first scene juxtaposes images of uptown Manhattan with a voice-over from the outer Attenboroughs: “Dawn breaks over one of the most inhospitable places on earth: the hood.” Foregrounding the show’s extinction conceit and analytical bent, the narration envisions the inner city as dangerous terrain. We get the point—but maybe we can’t get over the fact that they’re showing us the heart of Harlem, 125th Street, where Magic Johnson invests and Bill Clinton HQs and you pay $60 for the prix fixe at Red Rooster if you can get a table. After we’re done not getting over that, we start supposing that Comedy Central can’t very well go around depicting abjection directly. Despite the show’s explicit concerns with gang violence and disintegrated family structures—and regardless of its thoughtful, brief treatments of those issues—its default setting is tonal brightness; a brief mention of Trayvon Martin is jarring. It’s clear from the go that The Endangered List—clowning around while juggling weighty matters, tossing out big ideas about social reform and small un-P.C. jokes at once—has set itself an impossible balancing act. Its unevenness is inherent in its nature. The meat of The Endangered List is a series of interviews Hughley conducts with experts, blowhards, model citizens, and random gangbangers, ostensibly gathering data to present to the government. The best explores crime; the host attempts to talk some sense into two teenage Crips, then talks to a policy guy about the prison industry, then buys the Crips shares in a company that operates for-profit prisons. The irony when he hands them their stock certificates is almost as vicious as the nature of mass incarceration itself. Elsewhere, Hughley uses a Daily Show-style ambush to make a buffoon of a homophobic church leader and a light touch to revisit a case of environmental racism in Dickson, Tennessee. Less profitable is his sit-down with a very polite representative of the Nazi Party. Why bother? One rather doubts that nonviolent Nazi activists—certainly not the type game for going on Comedy Central—pose a threat to black America. I suspect that Hughley invited this fringe figure on simply so that they could share a black-and-white cookie. The bit slightly cheapens the project, which is something of a dessert itself—a healthy snack of food-for-thought, half baked in parts, with a strange balance of bitter and sweet.